Laja (Léa) Feldblum was born July 1, 1918, in Warsaw. She had two siblings, a sister Rywka and a brother Moses. Her family moved to Antwerp in 1929. After the German occupation of Belgium, the Feldblums fled to France, where they were assigned residence at Bousquet-d'Orb near Montpellier. Léa's parents died in Montpellier eight months apart. Her sister and brother were deported to their death in Auschwitz on September 12, 1942. Léa then went to work as a teacher and counselor at the OSE children's home in Palavas-les-Flots. From there she moved to the home in Campestre à Lodève. Léa was then transferred to the OSE's new headquarters in Chambèry, in the Italian zone. Finally, she joined the staff of the children's home in Izieu, where she lived under the assumed name of Marie-Louise Decoste. Léa was rounded-up during the April 6 raid on the home. At Drancy, she revealed her true identity so that she would be deported with the children. 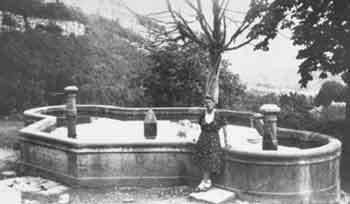 (Léa had already twice declined the opportunity to cross into Switzerland.) When she arrived in Auschwitz on April 15, 1944, Léa led the column of Izieu children to the selection point. When she informed the SS that these children were from a home, she was ruthlessly separated from them and sent to the prisoners' camp. Léa survived and was liberated at Auschwitz in January 1945. She soon returned to France by way of Odessa. In 1946 Léa immigrated to Palestine, where she was married that same year. Two years later, however, her husband fell in the Israeli War of Independence. Feldblum testified in the trial against Klaus Barbie, the head of the Gestapo and so-called "butcher of Lyon," in 1987. He was convicted of crimes against humanity.